While not the combination of Lev Yashin and Jorge Campos that some would have you believe, there is no doubt that De Gea was the shining light of United's season. He may not be irreplaceable - if the powers that be at Old Trafford have any sense, they'll go to Stamford Bridge with a blank cheque, and say "Name your price for Petr Cech" - but De Gea was largely responsible for ensuring United didn't fall out of contention for the top four in the first-half of the season. His performances against Liverpool, Everton and Arsenal were worth at least an extra 7 points. While United were better, if still not great, in defence as the season progressed, it was De Gea who made sure his team remained competitive as they took time to learn the methods of Louis Van Gaal. It's astonishing to think of how he's improved from the player who was a liability in his first season n England. If, as expected, he lines up in a Real Madrid shirt next season, he left United fans with one hell of a campaign to remember him by. One of my all-time favourite defenders is Denis Irwin. Maybe it's to do with where I played in park football, but I've always had a fondness for a dependable, unsung, never worse than "7 out of 10" full-back. Ivanovic is a player in the mould of Irwin. A player where you struggle to recall a match in which he performed poorly. Despite being a natural centre-back, he's been the best Premier League right-back of his era. Not only is he a mountainous presence in defence, but he's also proved increasingly useful in an attacking sense. Always an aerial threat at set-pieces, his winning goal against Aston Villa shows his improved threat from open play. Not many full-backs end a season with 4 goals and 5 assists. This was a difficult choice, but ultimately I went for the other Chelsea full-back. While his form went through a slight dip during the winter, the Spaniard was mainly an indomitable presence defending Chelsea's left flank. While pressed into service at left back in an emergency, Jose Mourinho has helped convert Azpilicueta from a buccaneering - if flaky - right-back, to arguably the best one-on-one defender in England. He's the underrated part of the most obstinate back four in the league. I'd advise you to get on the Azpilicueta bandwagon now. He'll soon become a favourite of the punditocracy; one of those "underrated" players who never stops being rated by those who get paid to talk about the game. Last season, he was thought of by many - me included - as the junior member of an impressive Southampton defence, someone who was lucky to be playing alongside Dejan Lovren, and was simply riding in the slipstream of the Croat. After taking Atletico Madrid to the La Liga title (and seconds away from winning the Champions League), Diego Simeone appeared to have little quarrel in letting Alderweireld leave the club. Sent to Southampton on loan - as a replacement for the Liverpool bound Dejan Lovren - Alderweireld went from useful utility man, to a pivotal part of a Southampton team that at one stage, looked as if they could seriously challenge the established Premier League elite. Alderweireld slotted in seamlessly alongside Jose Fonte, often providing the silk to go with the Portugese's steel and anticipation. Also able to play at right-baclk or central midfield, Alderweireld's technical ability ensured Southampton had a ball playing defender to begin their attacks. With his loan period expired, it seems as if Alderweireld won't be returning to Southampton. Unsurprisingly, he's been linked with moves to clubs such as Tottenham. Wherever he ends up, he won't be easy for Southampton to replace. As an Arsenal fan, the thought of Cesc in a Chelsea shirt made me want to cry with sorrow, and vomit with disgust. But I was hoping against hope that the Catalan would be a broken man after his dream move to Barcelona turned sour. It took only 20 minutes of his first match to realise that he was the same player that left the Emirates, providing a sublime assist for Andre Schurrle against Burnley. He didn't produce the goal ratio I expected from him, only finding the net 3 times in the league, but this was partly due to him playing as an orthodox central midfield playmaker, rather than in a trequartista role. Cesc still has his critics who say he lacks the temperament to perform when it matters, but when a player gets 18 assists - 7 more than any other player - it seems churlish to say that the Spaniard wasn't a crucial factor in Chelsea winning their first league title since 2010. And his late winner against QPR - the one that finally shut down the title race - showed that he can also deliver after the turn of the calendar year. I cede to no-one in my admiration of Schneiderlin. I thought his debut Premier League season was so auspicious, that he made my best XI that year. There's a reason that Southampton reluctantly allowed Rickie Lambert, Calum Chambers, Dejan Lovren, and Adam Lallana to leave the club, but not Schneiderlin. The Frenchman is the lynchpin of the side. A superb modern-day defensive midfielder - who specialises in interceptions, rather than crunching tackles - that is also technically competent, he was once again one of the best players in a Southampton side that again punched above its weight. It seems as if Schneiderlin's time at St Mary's is finally coming to an end, as he heads for greener pastures next season. Southampton have excelled at finding able replacements for the heralded players that they've sold, but they'll need to find someone special to adequately replace Schneiderlin. This was the toughest position to fill, simply due to the lack of quality - which shows how ordinary this season was. However, despite a largely dismal showing, Silva was one of the few Manchester City players to perform near his expected standards. He shone in that period when City pulled level on points with Chelsea (and we thought we'd have a title race worthy of the name) playing key roles in wins over West Brom, Crystal Palace, and Newcastle. While a master technician, one criticism often levelled at Silva is his lack of goals for someone in his position. Well, this season he scored 12 in the league, the first time he passed 10 goals for the season since playing in England. Silva is a player with a licence to roam around the pitch, but Manuel Pelligrini's penchant to line up in a 4-4-2 meant that Silva was often nominally right-sided player, and there was no better right-sided midfield player in the Premier League this season than him. As tough as it was to choose a player for the right flank, it was equally easy to pick one for the left. One of the most satisfying things for any sports fan is to see the amorphous clay of potential calcify into brilliance. From a gifted, if somewhat lightweight wide forward, Eden Hazard has developed into the leading light of this past season. Journalist, Gabriele Marcotti did a good breakdown on how Hazard has adapted his play during his career. With Cesc Fabregas operating in a position further back, it's Hazard's job to be the gamebreaker in the final third, the man who has to make the key interventions that turn dominance into goals. One of Hazard's problems was that for all his skills. he was often too decorative, rather than decisive. However, after this superb assist in the early season summit meeting against Manchester city, Hazard never looked back. As well as his 9 assists, Hazard's goal tally of 14 was invaluable. Not only the volume of goals, but the timing of them. His goals over West Ham, Manchester United, and the title-clincher against Crystal Palace were worth 9 points to Chelsea over the course of the season. This is in addition to his remarkable courage, routinely having his legs tattooed by stud marks from more cowardly opponents, and yet not letting it discourage him for a moment. A mark of the best players is producing when it matters most. 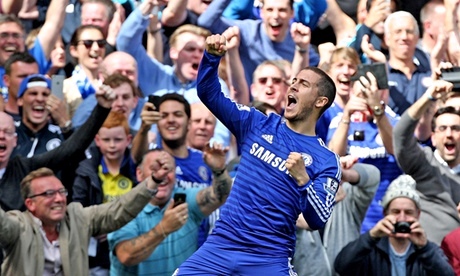 Eden Hazard has shown he's among European football's very best. While not a player I'd pay money to watch, one of the stories of the season has been the metempsychosis of Marouane Fellaini. On the verge of being loaned out to Napoli before injury scuppered the move, the Belgian was thrown on away to West Brom and his impact was such that he became a key part of a United team that used a more direct style to resurrect their season. His influence may only be short-lived, as one would expect a more expansive United next term, But a manager's job is to get the best out of the players at his disposal, and while other more heralded names failed to function (for varying reasons), the use of Fellaini as a battering ram proved effective, especially in their 2-1 win over Liverpool. He also scored important goals in victories over QPR and Crystal Palace. He may not be the prettiest player to watch, but he's damned tough to defend against. It's easy to forget the exploits of the Argentine. Manchester City's awful defence of their Premier League title (again) obfuscated that Aguero was one of the few City players to play to his expected productivity. He was especially on fire during in earlier part of the campaign, evidenced by his hat-tricks against Tottenham and Bayern Munich - which kept City from early elimination in the Champions League. Many of his teammates underperformed as City's attempts to retain the league title dissolved as we went into 2015, but Aguero continued to be a consistent presence on the goalscoring charts, and while the attention of many was taken up by the exploits of a "one of their own" at White Hart Lane, it was Aguero who was the Premier League's top scorer. At a canter. 26 goals in 33 appearances. He remains the best centre-forward in the country. - Yes, even better than Pablo Zabaleta. - Assuming he'd have to play with Jan Vertonghen, I actually don't think he'd be a good fit at Spurs. - While it's a credit to Hazard, it's not to Premier League officials. The way they allow Hazard to be treated is shameful, and is something I hope isn't repeated next season. P.S. For those wondering where John Terry and Diego Costa are, while I'm fully aware of how well they played on the pitch, they are disqualified from consideration for the same reasons why I would never have someone like Luis Suarez or Ched Evans in a best XI. I'm not asking players to be perfect. I'm just asking them not to do abhorrent things, and then be unrepentant about it.